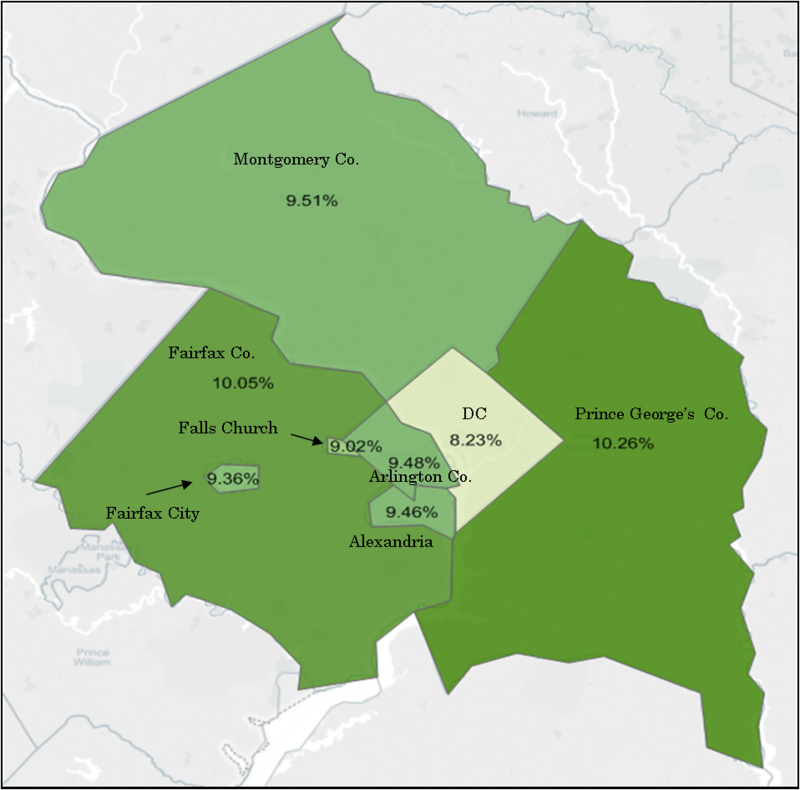 In 2013, a household in the District’s suburbs with an income of $75,000 paid 9 percent to 25 percent more in state and local taxes than a DC household with the same income. Each year, the Office of Revenue Analysis produces a study called “Tax Rates and Tax Burdens: Washington Metropolitan Area 2013,” in which we estimate state and local tax burdens for a family of three at different income levels in eight Washington-area jurisdictions. The jurisdictions are DC; Montgomery and Prince George’s counties in Maryland; Arlington and Fairfax counties in Virginia; and the Virginia cities of Alexandria, Fairfax, and Falls Church. For the 2013 tax year, we find that DC has the lowest combined tax burdens compared to its metro area neighbors across four main taxes (income, property, sales, and auto taxes), and at each annual income level in the report ($25,000; $50,000; $75,000; $100,000; and $150,000). In 2005, DC estimated burdens were highest at the $25,000 income level, and 3rd highest at all other income levels. This was right before a series of major income and property tax reductions. In 2006, DC’s lowest, middle, and top individual income tax rates decreased from 5.0 to 4.5 percent, 7.5 to 7.0 percent, and 9.0 to 8.7 percent, respectively. The middle rate range expanded to cover income up to $40,000 (before, it was applied to income above $10,000 and below $30,000). In 2007, these individual income tax rates were further lowered from 4.5 to 4.0 percent, 7.0 to 6.0 percent, and 8.7 to 8.5 percent, respectively. Further, in 2006, DC increased its Earned Income Tax Credit (EITC) match from 25 percent to 35 percent of the federal credit, and in 2008, from 35 to 40 percent of the federal credit, offering a greater benefit to low-income households. In 2011, DC raised its top income tax rate on residents earning over $350,000 per year from 8.5 percent to 8.95 percent; however, this did not impact any of the hypothetical families in the study. Real property rates declined gradually, too, from $0.96 per $100 of assessed value in 2005 to $0.85 in 2008, while the homestead exemption for residents who own their homes increased from $38,000 in 2005 to $69,100 in 2013. The full report with more metro area maps at different income levels and the methodology can be found here: http://cfo.dc.gov/page/tax-burdens-comparison. What exactly is this data? We calculated the tax burdens using housing value data from the U.S. Census Bureau’s American Community Survey; income profile data from the Internal Revenue Service’s DC Statistics of Income; consumption information from the Bureau of Labor Statistics’ Consumer Expenditure Survey, and auto data from the Environmental Protection Agency, the National Automobile Dealers Association Used Car Guide, and the Department of Energy. All tax rate data were obtained from local area tax officials or from local government web sites. Next > Tax Day. What’s the Average Refund in the District?